Before we get up in the morning, the first thing we do is to turn off the alarm which has woken us up. Getting down from the bed, brushing teeth, having bath and getting ready for the daily routine, we encounter several products like toothbrush, bucket, mug, mirror, comb etc. all made of PLASTIC. Plastic has occupied our daily lives in a very unexpected manner. Its qualities like being cost-effective, lighter in weight, easy availability and ergonomy have made it an essential element in the manufacturing of various items. 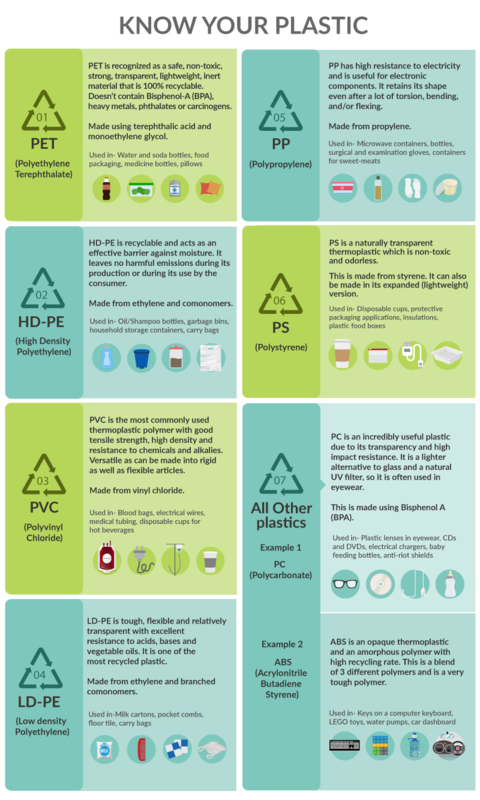 Although there is a bad picture created in our head about plastic, it’s important to know that plastic too has various types, and not all plastic types are harmless, neither are they all harmful. We come across various news reports talking about the ill-effects, but they never really tell us the other side of the story. Here in this article, we have tried to unearth the goodness of a form of plastic which we use in our daily lives. Before we begin, let us first know what is Plastic? Plastic essentially is a compound which is highly malleable and can be moulded into shapes big and small. It can be made of synthetic or semi-synthetic substance. Over the years, plastic has replaced many popular materials. It is cheaper and is exceptionally versatile. There are different types of plastics, and it is important to know these types and how they suit our needs. 1. PET (Polyethylene Terephthalate), also known as PET or PETE is the most commonly used and the safest form of plastic. It is a transparent and semi-crystalline resin. The popularity of this plastic is due to various reasons; one of them is that it is 100% recyclable. It’s lightweight and strength makes it versatile, and it acts as a barrier from gas and moisture. It does not contain heavy metal, carcinogens and Bisphenol A. This makes PET thoroughly non-toxic and safe to be used in containers for food and beverages, medicine bottles etc. It has the resin identification code 1, inside the recycle triangle. 2. HD-PE (High-density polyethylene) has a number 2 resin identification code. It’s most important property is its strength to density ratio making it extremely strong. It is also non-soluble to most solvents and creates a sound barrier against moisture. Made of ethylene and comonomers, it does not emit harmful gases. 3. PVC (Polyvinyl chloride) is made from vinyl chloride and is the most commonly used thermoplastic polymer. It is considered to be one of the most widely produced synthetic plastic polymers. It comes in two variations – flexible and rigid. In its rigid form, its usage ranges from construction of pipe to credit cards. On the other hand, in its flexible form, it is used in making cables, faux leather or inflatable products. 4. LD-PE (Low-density polyethylene) is the stumpy density plastic that is flexible and can resist acids and oils. 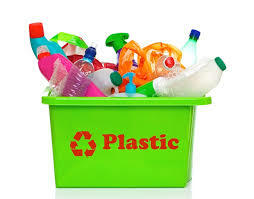 It is difficult to recycle and used as a polyethylene for various products packaging including, food, toys, cartons etc. 5. PP (Polypropylene) is made of propylene. It is a highly resistant compound and can retain its form under extreme conditions of flexing, bending and torsion. Its high resistance makes it useful in electrical products. It is also used in microwave containers and surgical gloves besides food containers. 6. PS (Polystyrene) is made of styrene and is a colourless and odourless form of thermoplastic. However, it can be coloured with colourants. It is available in solid and foamed form and is a bad resistant to oxygen and vapour with a low melting point. 7. Other plastics – There are several other types of plastics too which are generally used in India. These recyclable plastics are clubbed under the code 7. Among them, Polycarbonate aka, PC deserves special mention. It is particularly handy because of its transparency and its ability to maintain its shape and character even under high impact. It is commonly used in different types of eyewear as it is a lighter substitute for glass and can act as a UV filter. Now let us know about a type of plastic which is totally harmless and does not pose any threat to our health, which is PET (Polyethylene Terephthalate). In our day to day needs, PET has emerged to be the most sustainable plastic packaging choice. In spite of many myths around it, PET is 100% non-toxic and devoid of carcinogens. It has been cleared by US Food and Drug Administration and its European counterpart, the European Food Safety Authority as perfectly safe to use. It is used in several products like water bottles, jars, storage containers etc. PET bottles are the first choice for storage of any beverages. It protects the food and drinks from being spoilt as it provides a significant barrier from moisture and air. PET containers are also resealable, hence, making sure that no food is wasted. The WHO has also recommended that PET can be used for packaging food and medicines. Transparent PET containers also help the consumer know what exactly they buy. As we conclude, we just wish to remind our readers that next time you decide to use any PET product, don’t be afraid or get carried away by frivolous publicity. Make a choice that’s healthy for you and our environment both.